Drumrolls, please…With this easy spinach artichoke dip, I’ve included for the first time artichokes in a recipe. Since I’ve done my extensive research on foods with high amounts of dietary fiber some months ago, I knew I needed a simple way to implement these fibrous vegetables in my nutrition. 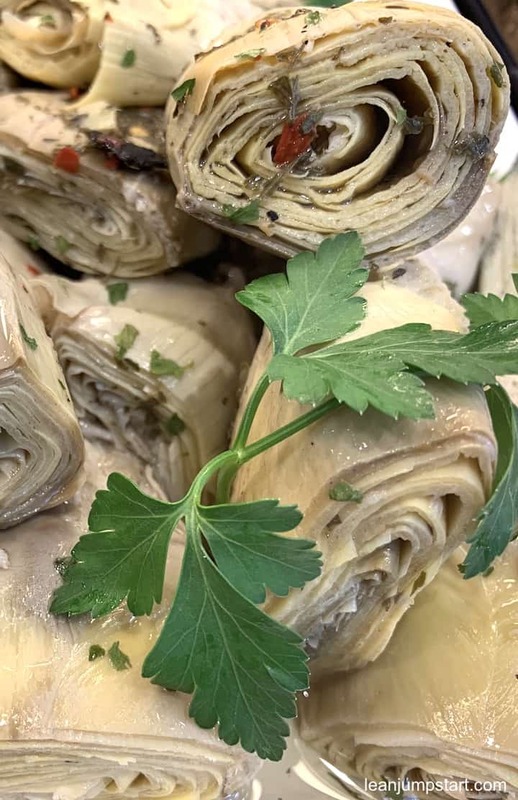 See…on my top 10 list of fiber rich vegetables, artichokes are an excellent source and ranking number one (chart at the end of this blog post). As a result I created a high fiber dip which is hard to beat. I’ll talk about that aspect later. I bet you’ve seen them already. You know, these green, brown, purple vegetables, which remind me a bit of thistle. And in fact, artichokes are flower buds of a large, perennial thistle plant that produces bright flowers. Anyway…in the meanwhile, I’ve found an easy method how to cook artichokes, although you won’t need it for this dip. To simplify this recipe, I’ve used a jar with marinated artichokes as an almost perfect shortcut. When they offer them from time to time at Aldi I buy them in a bulk. Heads up: While marinated artichokes are great sources of fiber, vitamins C and A, you should still enjoy them in moderation. As they are high in oil and sodium, I recommend draining them thoroughly before combining with the mix. A lighter option is jars with marinated artichokes in salt water. But those are hard to get and often they come with a hefty price tag. Don’t let perfect be the enemy of good! Another idea is to use artichokes in cans, but it’s not easy to get BPA-free cans and again these are also not additive free. At least they are oil free as they swim in salted water. What ever shortcut option you prefer, it probably won’t be totally clean. But that’s ok, as artichokes still offer so many health benefits which these shortcuts can’t neutralize. As with many other 80/20 clean eating recipes, we again won’t let perfect be the enemy of “good”. Update: In the meanwhile, I’ve found my perfect way how to cook artichokes on the stove. As you can see it is a vegan recipe and you don’t need any cream or parmesan cheese. 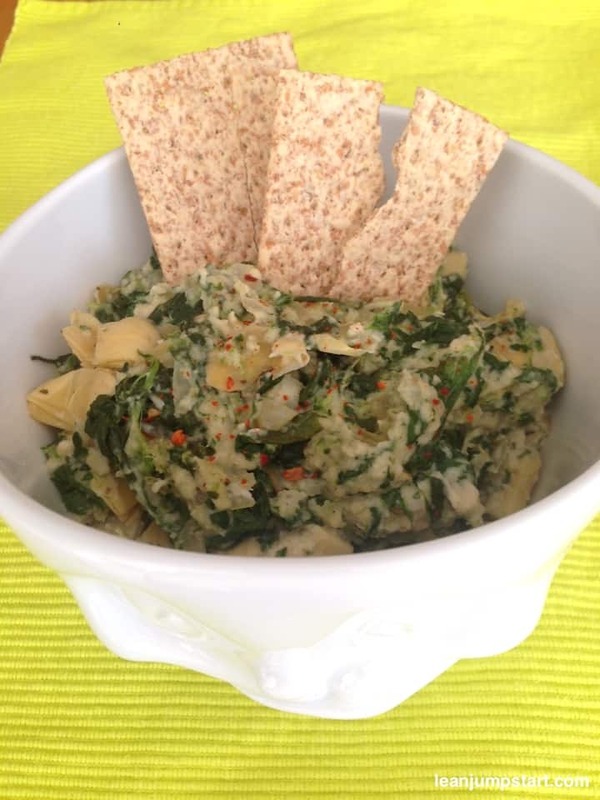 Whether warm or cold, this healthy spinach artichoke dip or spread is a great companion for whole grain crackers or bread. It is also ideal for parties or barbecues. With a colorful plate of vegetable sticks (peppers, carrots, celery sticks, cucumbers, kohlrabi, etc.) it is a healthy accompaniment. Mix white beans in a blender or food processor together with the cashews, the nutritional yeast, and the lemon juice. Sauté the onion in some oil or water over medium heat for about 2 minutes. Add the garlic for a minute. In the next step add the thawed spinach and cook for 3 more minutes. Stir in the artichokes and add the white bean cashew mixture. Season with salt, pepper, (optional) and red pepper flakes. Serve with whole wheat crackers. You can also use 4 cups of fresh spinach instead. This is something the Romans already took advantage of. Artichokes contain flavonoids and the bitter component cynarin. To ensure that the substances work properly, it is perfect to eat them before the main course itself. This is the reason why artichokes are often served as antipasti in Mediterranean countries. If you combine them in a dip like in this recipe you have also an optimal starter before a regular meal. I mentioned in the beginning that artichokes are high fiber vegetables. You can see the proof in the following chart, where they lead the ranking list. Did you know that spinach contains tons of beta-carotene? I hear you asking, is there any fiber in spinach too? 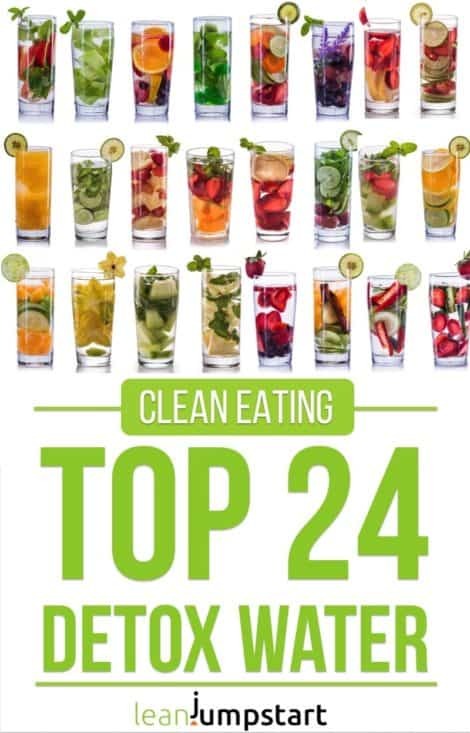 When you look closely at the table above, you will find also spinach among the top 30 vegetables – even ranking before red cabbage. Spinach and cashews are both good sources of roughage. Add to that the fibrous white beans which belong to the powerful family of legumes. 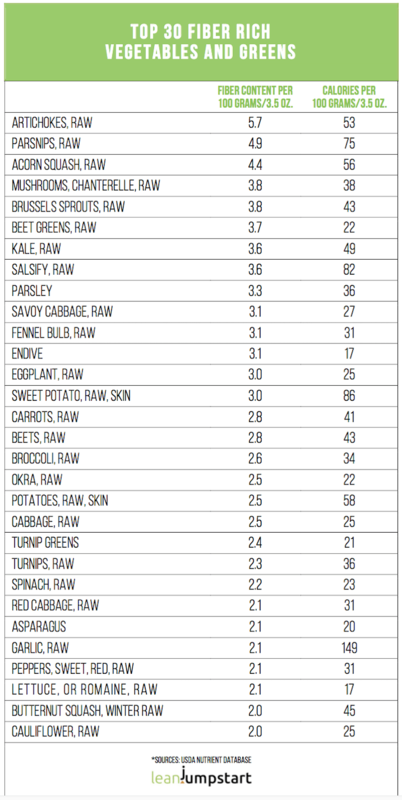 Click here for more charts with fiber-rich foods including some important studies on their health benefits. If you can choose between artichokes marinated in sunflower oil and olive oil, I recommend that you buy jars with olive oil. The reason: Sunflower oil contains significantly more omega 6 fatty acids, which can promote inflammatory processes when in an unbalanced ratio to omega 3. My best artichoke spinach dip ever (until then) I’ve eaten in a German hard rock cafe in Heidelberg, many years ago. I suppose it was based on cream cheese, neither dairy-free, nor clean. And yet I’m proud to say that my plant-based, vegan spinach and artichoke dip everyone loves, can easily compete with the one served in the Hard Rock Cafe. If you are a vegetarian you could always replace white beans and nutritional yeast with some sour cream. I’ve even seen recipes with sweet potatoes. 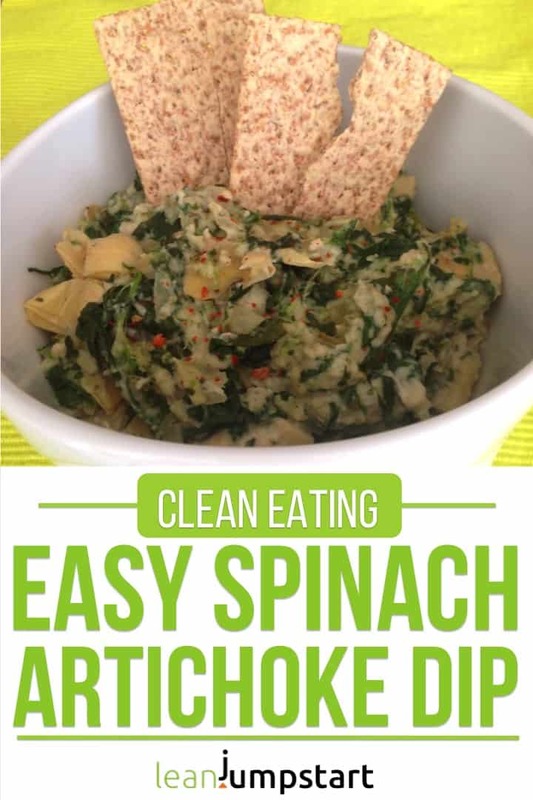 Recipe tip: check also my easy spinach artichoke pasta. Wow, this is amazing! I never thought that spinach artichoke dip could be made without some sort of creamy base, but you showed me! This looks absolutely delish. Thank you Eden! Yes with soaked cashews and beans you get a wonderful, protein rich cream at least as good as cream cheese. I love that you use cashews to make it creamy! Thanks Hannah! Yes cashews make this dip creamy. As cashews have a lower fat profile, this vegan spinach artichoke dip is also lighter than if I had used e.g. pecans or macadamia nuts. I LOVE how easy this recipe is and how delicious it is! My newest go to for snacking! You are welcome Sue. I’ve also learned theses fascinating facts only, when I researched the topic of high fiber foods. Now I can’t have enough artichoke recipes. We always have this dip on game day so I can’t wait to try your recipe! It looks so easy to make! I think I would love your game days, Demeter. Yes it’s really a simple recipe – Enjoy! This sounds like a really tasty dip, with loads of healthy nutrition and flavours. Buying your artichokes in a jar is a very handy way of doing it, and I find they are reasonably priced too. Thank you Katherine! Yes, if you can buy your artichoke jars at Aldi you can save even more money. What a brilliant idea this dip is – IMO ! I often only use those canned artichoke hearts to top salads with – so boring I know! Next time I grab me a can from the store, I am so making this dip! Sounds delish! I love that you used cashews and beans in this. What a great idea! Yes cashews are so flexible and also one of those nuts with the lowest fat content. Instead of dairy like Parmesan cheese or mozzarella cheeses I love to use beans as creamy, plant based protein source of highest quality. I am a big fan of this kind of dip never tried it with artichokes yummy! will do it! Thanks for sharing this recipe! Can’t wait to make this at home. Been trying out artichoke dip recipes here and there and definitely excited to try this one!